I cannot believe it’s been two years since the release of my first volume of poetry Prevail: Poems on Life, Love, and Politics. Seems like it was only yesterday when I saw the email that the book had gone to the printer. And roughly 10-14 days later, it was available to purchase. Seeing my work published, especially this collection, was a major milestone. I went through a lot to get to that stage. And my what I’ve learned in the time since it was published. I was trying to do everything when Prevail came out. To maintain the little bit of sanity I have left, I had to pump my breaks. I realized that if I broke my goals up into smaller pieces, execution wouldn’t be as difficult. This allowed for quick wins, which in essence brings you closer to achieving your ultimate goals (versus trying to attack everything head on all at once). My goal this year was increasing visibility in the DC metro area (i.e. attending more events, performing, and making connections/building relationships). I went after some opportunities, while other opportunities came to me (all of which I’m extremely grateful). I’m in the process of planning for events for the latter half of the year (I’ll be sharing news about this soon). Aside from releasing my next two projects, the goal for 2015/2016 will be increasing visibility in other regions of the country. After going through the publishing process with my first project, I feel like I could teach a course or two. There’s no need to spend a lot of money buying packages through an on-demand or vanity press when you don’t have to. Doing it yourself may be a more cost-effective option, especially if you have access to the right resources. Whether you self-publish or get picked up by a publishing company (indie or mainstream), you will still be on the hook for marketing/promoting your work. At this stage, I’d rather have more control over the finished product and how its marketed/promoted. Information about my next two projects is forthcoming. In the interim, be sure to check out my previous posts about Prevail. And if so inclined, buy a copy of Prevail, write a review, and tell a friend! 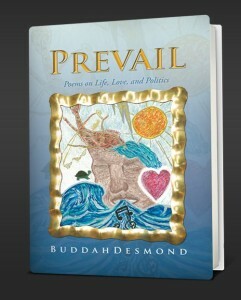 This entry was posted in Anniversary, Books, Introspection, Poetry, Prevail, Reflection, Writing by BuddahDesmond611. Bookmark the permalink.